WICHITA, Apr. 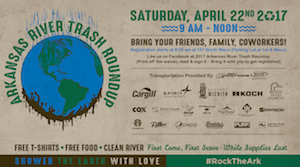 21 /CSRwire/ - Taking place on Earth Day, the 16th annual Arkansas River Trash Roundup will see hundreds of volunteers remove tons of garbage from downtown area waters, benefitting both the river and wetlands restoration efforts at Wichita’s Great Plains Nature Center by Wichita Ducks Unlimited. Over the past 15 years, more than 25 tons of trash was collected, with 2016 attracting 1,310 volunteers, the highest number of participants to date. Registration for 2017 volunteers begins 8:00 a.m., Saturday, April 22, at 151 North Waco, in the parking lot north of the Drury Hotel on the southwest corner of Waco and North 1st streets. The 2016 Arkansas River Trash Roundup set a record for participants that was previously established in 2015, when 855 people eager to improve the waterway for all who work, live or visit Wichita, as well as for those who use the river, gathered in downtown to remove garbage. Organizers have their sights set on once again breaking records for garbage collection, participants and raising funds for a Wichita Ducks Unlimited project involving the renovation of a wetlands area at the Great Plains Nature Center. Serving as the City of Wichita’s largest Earth Day event, the Arkansas River Trash Roundup has generated approximately $90,000 in total proceeds for Wichita Ducks Unlimited, which previously used funds from the Trash Roundup for the now-completed Slate Creek wetlands restoration, in addition to supporting the organization’s Greenwings youth education program. Sponsors and donors for this year’s roundup include: The City of Wichita, Cargill, Spirit AeroSystems, Wichita Ducks Unlimited, KOCH Industries, Cox Communications, Dillons, Waste Connections, Freddy’s Frozen Custard & Steakburgers, Pepsi, Starbucks, Ray Rental, Party Express Bus, Success NationaLease, Spectrum Promotional, Envision, Davis/Moore BIG AL Chevrolet, American Rivers, PURE Productions and Smile Craft Family Dental. Cargill, which has earmarked a $20,000 donation to this year’s event, will be a title sponsor for the ninth consecutive year. Wichita Ducks Unlimited will use proceeds raised from the river cleanup to help underwrite a wetlands restoration project at the Great Plains Nature Center. This project includes the restoration of two acres of wetlands adjacent to the Center’s wetlands exhibit room. Due to a natural beaver dam, the wetlands area was once a vibrant habitat for various species and migrating waterfowl. When the beavers disappeared and their dam has ceased to exist, the wetland water level dropped, effectively draining much of the marsh. This new project will recreate the dam through the installation of a low levee to mimic what the beavers once built. A water control structure will also be installed to allow the lowering of the water table for management purposes, and to promote ideal wildlife conditions and the growth of natural vegetation. “We are thrilled to have additional, new, sponsors support our efforts and it is exciting to see schools, universities, youth organizations and members of the community embrace this event and pitch in to make the Arkansas River Trash Roundup a popular annual event,” stated Cindy Le, environmental specialist with the Wichita department of Public Works. “We are building on a 15-year legacy of growing this event into one of the premier Earth Day waterway events in the nation that demonstrates how we can help Wichita’s natural environment thrive.” Wichita Mayor Jeff Longwell will proclaim April 22 as “Arkansas River Trash Roundup Day,” at an April 18 city council meeting. The goal for 2017 is to sign up more than the 1,310 volunteers that participated in 2016 and collect at least three tons of trash. T-shirts will be provided to volunteers while supplies last, and lunch will be served including grilled burgers from Cargill, hot dogs, chips, cookies and beverages. Geographically, the region that includes Wichita is part of the major transnational, intercontinental, south central flyway linking the Americas, with many species of migratory and non-migratory birds calling Central Kansas a place to reside, a place to nest or a temporary haven on flights to distant locations stretching from Canada to Latin America. For Cargill, the Arkansas River Trash Roundup represents an investment in the Wichita community to help it thrive as the company works to nourish the world in a safe, responsible and sustainable way.